Spirit of the Strathcona Symphony Orchestra. Monday night in the Comox Valley means it must be orchestra night! Over 60 community minded musicians from across the Comox Valley, Campbell River, and surrounding areas, travel to Courtenay each week to rehearse orchestral music with fellow music lovers. The musicians are employed at a variety of day jobs, are retired, or are students at North Island College or a local high school. 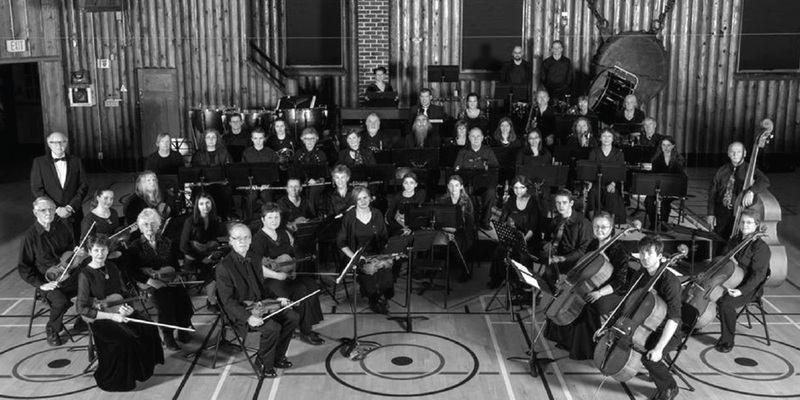 Together, they are the Strathcona Symphony Orchestra (SSO), a community music ensemble founded over a decade ago by Campbell River musician and teacher, Blaine Waldbauer. His dream of creating a permanent space for orchestral music in the Comox Valley has steadily blossomed over the last decade; what started as a fledgling group of string players has grown throughout the years to the full symphony orchestra we hear today. Blaine’s leadership as the first conductor, and now Concert Master, remains an integral part of the spirit of the orchestra. Off stage, the orchestra is guided by a dedicated group of Comox Valley volunteers who take care of a myriad of details that keep the SSO musical ship afloat. Courtenay resident, Michele Morton, deserves a great deal of credit in this regard for her tireless determination to keep the orchestra thriving. As President of the SSO Board of Directors, her steady hand has made sure every detail is met throughout the yearly concert season. This even included joining the percussion section on-stage to play an anvil with a hammer for the SSO’s January 2016 performance of Verdi’s The Anvil Chorus from Il Trovatore! Although Michele is stepping down from her leadership role in September, her enthusiasm for supporting the creative work of the SSO will remain as an inspiration for volunteers interested in offering support. As a recent retiree to Vancouver Island, it was a great pleasure for my wife and I to discover that such passion for orchestral music existed among both audiences and musicians living in the Comox Valley. My 35 years in the profession had made me a strong believer in the power that live music making can bring to the human spirit. I felt privileged to take up the baton as the new Conductor & Musical Director of the SSO for the 2015-16 concert season. It is a joy to guide musicians who are in their seats for the right reason—their love of playing music together with others. SSO members range in age from 13-75+. For some, it is their first adventure into orchestral music, while others have more than half a century of playing this kind of repertoire. The ‘young-at-heart’ members are encouraged to mentor the younger players, creating a wonderful atmosphere of intergenerational community spirit so often found in the Comox Valley. Membership remains open throughout the year to anyone who loves to play a string, brass, wind, or percussion instrument, even if it has been gathering dust in a closet for many years. The music that the SSO rehearses from September through May comes from orchestral selections written throughout the last 300 years. Sometimes this means standard repertoire like Johannes Brahms’ Hungarian Dance or the Overture to Die Fledermaus by Johann Strauss, while other times, we play contemporary music written for 21st century films like John Williams’ Star Wars. All concerts take place in the historic Native Son’s Hall, which is a beautiful venue for listening to live music. This space enhances the community feeling which embodies the SSO, and forges an intimate musical experience between performers and musicians alike. When you attend a concert of the SSO, you can see audiences of all ages enjoying the partnership that music and memories can create. Indeed, one of the magical aspects of live music is in its ability to transport the listener towards favourite memories, as familiar melodies can stir reflections of the past. This happened for many concertgoers in the May 2016 concert when the orchestra played The Wedding March from Midsummer Night’s Dream by Felix Mendelssohn. Heads were bobbing, faces were smiling, and all seemed to enjoy catching the spirit of memories that the performance of this piece by the musicians on stage could bring. The upcoming 2016-17 SSO concert season will open with a holiday inspired program, A Musical Sleigh Ride, on December 10, 2016. Audience members will be able to sit back and let the orchestra transport them on a journey through a winter wonderland, stirring memories of cold crisp nights by the fire. The second concert, Notes of Love on March 11-12, 2017, will be devoted to music that has some connection to love in all of its many forms. Listening to melodies from My Funny Valentine by Richard Rodgers or It’s All About Love by George Gershwin may carry many audience members towards romantic memories of the past. The final concert for the season is whimsically titled Ticket Stubs, and is scheduled for May 27-28, 2017. Let your mind wander through all types of entertainment in your life for which you presented a ticket for admittance, and our musical tribute will be just the ticket you need to stir those powerful memories!